Whether purchasing factory-finished products or engaging in a do-it-yourself project; be knowledgeable. Ask questions. Read labels. The key words are “volatile organic compounds,” commonly referred to as VOCs, usually listed in grams per liter. Lower VOC content products are obviously more environmentally friendly and pose lower health risks. According to EPA standards, to qualify as a zero-VOC finish, VOC content cannot exceed 5 grams per liter, and low-VOC finishes cannot contain more than 200 grams per liter. For consumers interested in finding the healthiest and most environmentally friendly products, please be aware. While paints, stains and other coatings can be emitters of VOCs, they are not alone. VOCs are emitted from many other products found in the home including carpeting, electronics, cosmetics, plastics, cleaning supplies, tobacco products, and more. Thanks to advances in wood-coating technology, many of today’s finishes are better than ever. Zero-and low-VOC finishes deliver the same quality, durability and performance as their predecessors. In the not-so-distant past, it was considered practically impossible to make high-quality finishes that did not emit VOCs, both during their application and throughout their service life. But that was then. Some manufacturers argue that today’s low-VOC finishes are even better than old solvent-based products. They require fewer coatings, provide equal performance and do it in a healthier way. Most zero-and low-VOC finishes are water-based. Because they contain no solvents, they are safe for people and the environment, and they give off virtually no odor. They’re also easier to use because they dry quickly, and clean-up can be tackled with plain soap and water. Disposal is simple, too. Most manufacturers have on-line calculators to help you determine exactly how much finish to buy, but if you end up with extra paint, stain or sealer, there’s no need to worry. Because of their natural ingredients, water-based finishes do not need to be taken to a hazardous waste center. Simply let open containers sit in a well-ventilated area, and once they solidify, place them in the trash. Of course, you could always leave the lid on and pass the finishes along to a neighbor or charity organization. Beyond traditional low- and no-VOC finishes, consumers can select from an increasing array of natural paints, stains, and sealers. These products, which are made with organic ingredients such as water, plant extracts and minerals are naturally VOC-free. They give off almost no smell and, like most natural products; they are unlikely to trigger allergies or other sensitivities. Not a do-it-yourselfer? Keep in mind that it’s hard to go wrong with a prefinished or factory-finished product. Most manufacturers now use ultraviolet (UV) light to quickly cure several coats of low- or no-VOC urethane finish. 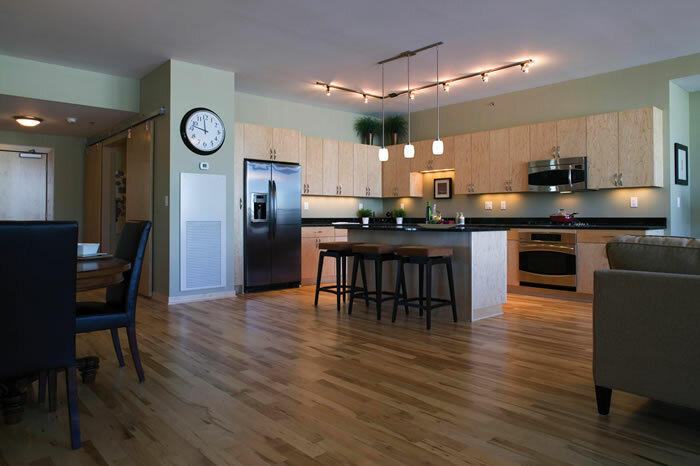 Some hardwood flooring manufacturers even add small aluminum oxide chips directly into the UV-cured finish, which dramatically increases the floor’s durability and life. But if you are a do-it-yourselfer preparing to finish hardwood cabinets, trim or flooring, you can choose from two basic types of finishes: those that penetrate the wood and those that sit on the wood’s surface. Penetrating stains and finishes do as their name suggests: they penetrate wood to form a protective seal. Stains soak in to provide color, and a wax coating gives a low-gloss satin sheen. These finishes include linseed, tung, and specialty oils. They require special cleaning products like solvent-based waxes, buffing pastes, or cleaning liquids, especially for wax-finished floors. Surface finishes include a stain covered by a protective layer or topcoat. Because of their durability and resistance to moisture, these finishes—which encompass polyurethanes, paints, shellac, varnish, lacquer and wax—are easier to maintain and more popular than ever. And advances in wood-coating technology have made them more environmentally-friendly.